Hey, guys are you ready for some “Xtreme” fun, but you’re concerned about the potential for massive head trauma inherent to actual quad racing? Maybe you’re just not as into mud as you think. That’s okay. This is what virtual racing was made for, all the exhilaration of racing, with none of the actual risk. At least, that’s the idea, anyway, but not all racing games are created equal. Now, if you’re into racing games, I can see why you might be tempted by Xtreme Quad Racing. The game looks quite impressive, with richly rendered backgrounds and graphics. There are four detailed quads to choose from and five different tracks. It also has the sweet feature of being able to switch between first and third person views on the fly, so the game has a lot going for at at first blush. But then you start to play, and it all falls apart. See, the number one most important aspect of any racing game is the actual racing. How the vehicle handles isn’t just a nice feature; it’s absolutely essential to the game, and this is where Xtreme Quad Racing fails. Instead of a thrilling race around the dirt track, you’re left frantically tilting your iPhone left and right while your quad careens from side to side like a hockey puck, and you’re left scraping along a wall, desperately trying to correct an out of control turn while your opponents whiz past. The game controls are generally fine, if a bit too sensitive (tilt to turn, right thumb to accelerate, left to brake), but the accompanying physics engine makes the overall experience unrealistic and unsatisfying. Instead of natural movement, the quads seem to float over the track. The tracks come with plenty of variety, but they almost seem designed to frustrate with carefully placed bends and jumps that almost invariably crash you into a wall. There is also no online capability to enhance the natural competitive nature of the game. In a nutshell, the game looks incredible, but actual racing is a headache. While it’s clear that developers have responded to some of their early criticism and have taken steps to improve the overall controls, the game is still not a satisfying racing experience, thanks to a flawed physics engine. Unless you’re a total die hard racing fan, give this one a pass. 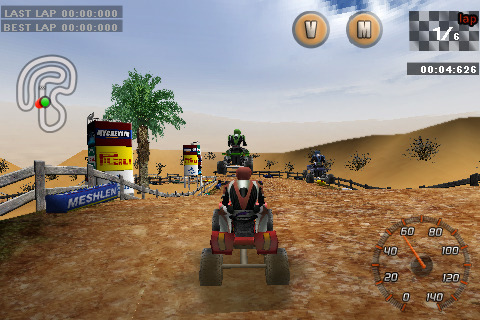 AppSafari review of Xtreme Quad Racing was written by Tracy Yonemoto on June 2nd, 2010 and categorized under App Store, Games, Physics Based, Racing. Page viewed 4317 times, 1 so far today. Need help on using these apps? Please read the Help Page.